Whew…you would think taking some time to work on stuff would be more productive! But…I feel like I haven’t gotten much done. And I still need to do my taxes! So, a couple of weeks ago, I started giving a class where we do these step outs and then use the tangle, so you have a visual reference and a neat-o mini binder to keep them all in. 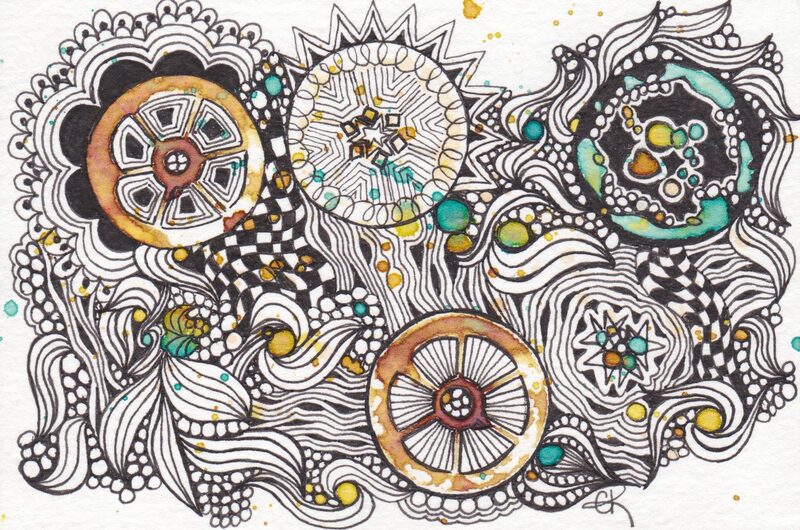 So, what better way to knock out my Diva Challenge (#253) for the new tangle, Molygon, from Zentangle HQ. Not only did I practice it real well by doing the step out, I was able to make a cool reference tile, right on the page. And, the bonus is that it is on my “to-do” list to complete at least one page a week for my reference. Ta-done! I also worked up this cute frame for the Valentangle class. Based on Joanne Fink’s Zendangles, it will be one of two options for the class on the 13th. Register here, pick your option for either the card or the frame. I need to prep the frames, so preregistration is a must! Got a major UFO (unfinished object) out of my studio this week, and hung for use. I like to up-cycle things that may no longer seem “fresh” and make them useful again. This ugly dart board case was just that object. Mike swears he bought it about 30 years ago, and it definitely had seen better days. Some Chalk Paint and trim pieces later, with a little Zentangle magic sprinkled in, and viola! It is now presentable! One important takeaway from this project. Gorilla Wood Glue does NOT dry clear…I may eventually touch up the paint where you can see the glue, but I was just so darn happy to have it off my workbench I didn’t even care! Lastly, I have a sneak peek at my prototype for some t-shirts you will be able to buy online or at the shop. Color them yourself…way cool. (this is a finished one, tangled a little and colored.) I just finished my “wash test” to make sure everything worked fine, so next it’s off to the printers to get them made. Looking forward to seeing people at the shop! Love the step out page. Your frame is really cool too! gosh, what marvellous ideas. They are all lovely. Love all of the stuff you show here. Can relate to feeling like you are busy doing a lot but not much to show for it. Like the pictures. Like the heart in the middle of the Molygon.